If your garage looks more like garbage, let’s do something about it. Our guide below can help you reclaim that valuable space and put it to good use. The first step is to get rid of everything. Relax. This is only temporary. However, if you want to make sure you’ve cleaned every nook and cranny, it will be much easier if the space is empty. As an added bonus, this will help immensely with organizing the space and eliminating some of the junk. So move everything to the porch, driveway or some other convenient area. Once the garage has been cleared out, break out the broom. Knock down any cobwebs and dust off any permanent shelving or other surfaces. Then, you can turn the broom the other direction and sweep the floor. Afterwards, spray the floor with the water hose or put your mop to work. If any stubborn stains (like oil) stick around, you might be able to soak them up with sawdust or kitty litter. Don’t toss everything back in there when the floor dries. 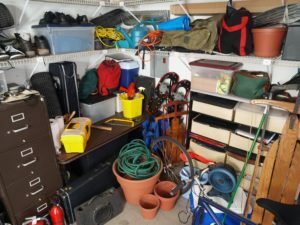 While you have the contents of your garage out in the open, sort through them. Toss broken items. Set aside things you want to sell or donate. Now, you can take the remaining items and begin arranging them in your garage. Group things by themes so it’s easier to find those various lawn care products or tools next time you need them. Take note of any seasonal items—particularly the things you only need 2-4 months out of the year. You may want to consider off-site storage for these during their downtime. You’ll appreciate the extra freedom in arranging your remaining most frequently used items, and who knows? You might even be able to park in there when you’re finished! Once everything is squared away, try to commit to a regular cleaning plan. If you stay on top of your maintenance schedule, the big annual clean-up won’t be such a big deal. If you want to learn more about storing your seasonal items, entire households or even boats and RVs, Storage World has you covered! Our friendly, knowledgeable staff is ready to answer any questions you may have. Our self-storage facilities in the Atlanta area offer a number of amenities including state-of-the-art security, climate-controlled storage units and even a free move-in truck! Whether you’re looking for temporary or long-term storage, we will work with you to find the solution that fits your needs. Stop by any of our Storage World facilities today!